Note: The picture above is the old filling station on the left and the post office and a grocery store on the right. I am the great-great-granddaughter of Daniel and Hannah Coger. Through Federal documentation and oral history as recalled by relatives, I have pieced part of our family’s history and identified Daniel and Hannah Coger as the family patriarch and matriarch. Daniel and Hannah Coger were born slaves in South Carolina reportedly in the “low country” area with a Gullah connection. I think this is true as family members referred to them as “Geechees”. They (Hannah and Daniel) were either sold or brought to Jefferson and Madison Counties Florida, sometime during the 1840’s. By the end of the Civil War, they were residing in a town called Williamsburg (currently known as Aucilla), Florida. It is believed that Aucilla was an old Indian Village, but no English translation has been found. There’s very little documented history of Aucilla; however, we know that there’s no other place in the nation named Aucilla. 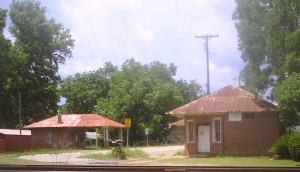 Downtown Aucilla is located at the intersection of Co. Rd. 257 and Co. Rd. 158. Some of the early white settlers of Aucilla have been identified as: The Hamricks, Kinseys, Lightseys, Walkers, Hawks and Bishops. These families were drawn to the village from South Carolina because of the availability of free and fertile land, as well as the abundance of forest areas, which they used to build their homes. According to the 1900’s Federal Census, Hannah Coger was the mother of eleven (11) children with ten (10) living. Daniel Coger was a farm hand. Neither were able to read or write (which is indicative of the times they lived and true of most slaves). From family accounts, Daniel Coger changed his name shortly after emancipation. It is uncertain whether he changed his first name, his last name, took on the name of his prior slave or rejected his last slave owner’s name. After an extensive review of the 1870 Federal Census and the 1860 Slave Schedule, I have found information to suggest there were no slave owners in Williamsburg named Coger. It has been difficult to trace the branches of our family tree due to arbitrary name changes, illiteracy, and misspelling of names. Daniel Coger is just one example of these types of mistakes/errors recorded in history. It is believed Daniel initially chose the last name “Coker” because evidence supports there was a slave owner residing in Madison County named Daniel Coker. However, I’ve discovered several variations of our last name: Coker, Cogar, Cogger, Cogan, and Koger. C-0-G-E-R, represents the last version of which this family is now using. After the Cogers were freed from slavery, they worked as farmers in Aucilla with the majority of their children living near them. Some of the men enlisted in the different branches of the military, while the women kept house. Other family members in Aucilla helped build the Aucilla Christian School, many of the roads in the area, as well as the railroad system that runs through Aucilla. It was commonly known, as reported by one family member, that the Cogers worked in “packs”, pulling other family members onto job sites and work assignments to complete together. This “pack” mentality of working extended to the Coger’s way of living. A couple of family members I was fortunate to interview indicated that Hannah and Daniel’s children lived between Highway 257 South and 158 West, in an area called the “Coger Woods.” The Coger Woods encompassed about 1200 acres of land which went almost to Drifton on the west and backed up to present day I-10 in some locations. Unfortunately, I was advised that the Cogers lost the property, as parents would have to use the only collateral they had as a resource to post bond after their children got into trouble. Having no other resource to reaccquire the land when they were unable to repay their debts, the land was quickly depleted. Hannah and Daniel lived long lives. Daniel’s tombstone states he died at 106 years old, while Hannah lived to be 80-something. They are both buried in the Emery Cemetery in Aucilla, Fl. Following their deaths in the early 1900’s about half of their children eventually moved from Aucilla to settle in other Florida cities, such as Deland, Palmetto, and McClenny. I am eager to fill the gaps of our family’s heritage. My next challenge is to confirm just how the Cogers came to Florida, who were their owners and what area of South Carolina they came from. One genealogist suggested that I look at the white families living near the Cogers in the 1870’s Federal Census, to get a hint at who the slave owners might have been. The 1870’s Federal Census indicated that Daniel Coger and his family lived near previous Jefferson County slave owners: Raysors, Walkers, Bishops and Kinseys. If you have any information about other African American Cogers in South Carolina (circa 1800s) or slave owners in Jefferson County, Florida (i.e., Raysors, Walkers, Bishops, and Kinseys) please share with us on this web site. The Coger descendants are over one thousand (1,000) strong and growing. We’d love to hear from you as we explore our ancestry!